I've seen the PetSafe Indoor Bark Control transmitter work on a room full of dogs. I've seen the PetSafe Indoor Bark Control transmitter work on a room full of dogs. I picked up the transmitter — which fit in the palm of my hand — and absent-mindedly flipped the switch on. I heard nothing, but every pooch in the room turned to look at me with a curious expression on his or her face. I had their full attention, and they were immediately quiet and orderly. The transmitter device is small enough to hide away in your decor — can you find it in this room? When the transmitter's microphone detects barking, the device emits an ultrasonic tone that reaches all dogs within 25 feet. It can be mounted to a wall, table leg, or any other flat surface, using built-in adhesive-backed pads. It's ideal for smaller dogs who might not be able to wear an anti-barking collar. Will it work through walls and doors? No it needs to be in the same area as your pet.. it will not work thru walls. 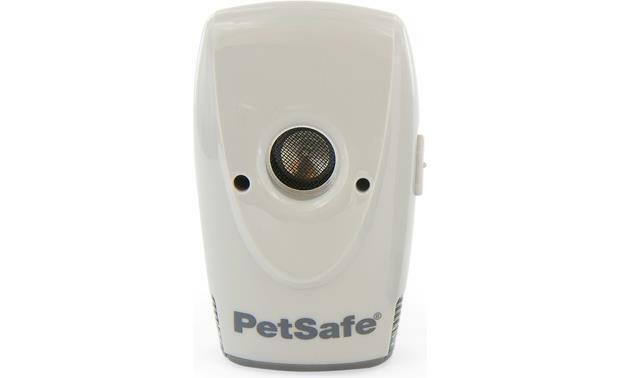 Overview: The PetSafe Indoor Bark Control (PBC00-15266) is a small device that emits an ultrasonic tone whenever your dog barks to correct your dog's nuisance behavior. Indoor Bark Control is 1-3/4" x 2-3/4" x 1-1/4" (WxHxD), and weighs about one ounce. Operation: The Indoor Bark Control device has a microphone that is tuned to a dog's bark. When barking is detected, it emits a high-frequency, ultrasonic sound that affects all dogs within range. Within a few days, your dog will learn to associate his barking with the high-pitch sound and will stop barking. Ultrasonic bark correction can often be the best solution for many dogs, avoiding the use of a bark collar. However, because of age, hearing ability, and temperament, it may not be as effective. The device should be turned off before playing with your dog, as he could associate playing with the correction. Indoor Bark Control is best for single dog homes. Placement: The Indoor Bark Control unit can be placed just about anywhere in the room where your dog barks the most. It can be placed freestanding on a shelf or a table, or attached to a wall or door frame with the supplied adhesive-backed hook-and-loop fastener. It has a range of approximately 25 feet. Power Requirements: The device operates on two 3-volt CR2032 lithium batteries (included). Average battery life is two months. A front-panel LED flashes red when batteries are low. Battery Life? What part nos for batteries? Searches related to the PetSafe Indoor Bark Control Ultrasonic anti-barking device.